1.Preheat oven to 350°F. In wide, shallow dish, combine flour, salt, paprika and white pepper. In large skillet, heat 1 tablespoon oil and butter over medium heat. Dip chicken in flour mixture to coat both sides; shake off excess flour. Add chicken to skillet and cook 5 to 6 minutes or until outside is golden brown, turning once. Transfer chicken to baking dish; cover with foil and bake 18 to 20 minutes or until internal temperature of chicken reaches 165°F. 2.Meanwhile, in same skillet, heat remaining oil over medium heat. Add garlic and cook 30 seconds; stir in crabmeat and cook 30 seconds. Add wine and lemon juice; heat to simmering and cook 30 seconds. Stir in asparagus and broth, and cook 3 minutes, stirring occasionally. Remove skillet from heat; stir in spinach. 3.To serve, preheat broiler. Place chicken on rimmed baking pan; evenly spoon crabmeat mixture over chicken and top each with 1 slice cheese. 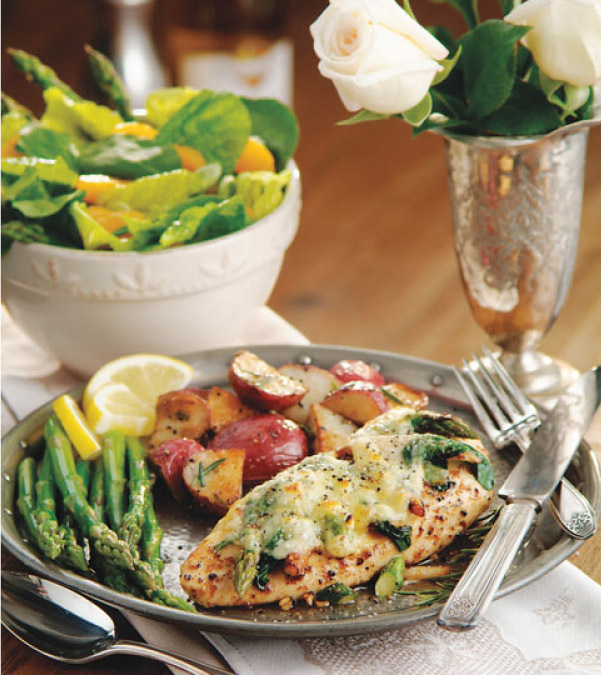 Broil chicken 2 to 3 minutes or until cheese is melted and lightly browned. Sprinkle chicken with pepper.